Investing in technology is unlike investing in any other sector. In this space, competition runs rampant, and products become obsolete in a matter of months. Below, you'll find our top seven strategies tailored specifically to investing in this space. Technology is about growth, innovation, and opportunity — not P/E, assets vs. liabilities, or debt-to-equity ratios. Of course, these metrics will matter at some point, but by the time they do, the company in question is likely already on its way out of what we consider to be the true technology sector. Take Apple (NASDAQ: AAPL), for example. While historically (and still widely) considered a technology company, it no longer helps us as investors to place Apple in that category. When the company was introducing innovative products the world had never seen before, it was still what we would consider a true tech company. But for the last half decade, Apple has been a producer of consumer goods more than anything else. The company found a line of products that sell incredibly well and began to play it safe. Innovation slowed, and so did investor gains. Gradually, it became less important to look at Apple's future as an innovator and more important to look at its PEG ratio. When we talk about the technology sector, we're talking about companies with innovative and unique products, new ideas, and the potential to grow into something huge. You wouldn't judge an infant by her SAT scores, and you shouldn't rank a tech stock based on standard valuation metrics. Historical Growth Rate: Compare long-term growth rates to short-term growth rates. If there is a consistent uptrend in revenue when approaching more recent time intervals, that's great news for a tech stock. Return on Equity (ROE): This measures the rate of return on shareholder interest. Compare a company's ROE to that of its peers. Earnings per Share (EPS): Like ROE, EPS is a measure of profitability. But instead of just comparing to industry peers, look at growth in EPS over time, as you would do with revenue. Debt to Earnings: As a rule of thumb, we want debt to be no more than five times annual earnings. Margins: Margins should be greater than the industry average and should improve over time. The media will sometimes promote an industry or even a specific company as "the next big thing." This kind of attention can often spur massive speculation and huge gains. Take Tesla's (NASDAQ: TSLA) 2013 performance, for example. A binge of positive media attention sent shares up 550% in less than 9 months. We can also look at the price of Bitcoin, which hit record highs almost immediately after a media frenzy surrounded the digital currency. The tech sector is especially vulnerable to this kind of speculation because a) technology can be difficult to fully understand and b) high levels of excitement drive investor behavior. Mass public focus on a particular technology doesn't just come out of thin air — these stories develop over time, and you can see them coming if you're paying close enough attention. It especially helps to follow search trends and realize when topics are gaining traction. Though it can be profitable to ride the wave of hype surrounding a particular stock, it's best to remain aware that when this hype dies down, many investors will lose interest and sell their shares. The last thing you want to do is get caught on the wrong side of a bubble, so when public expectations stray from reality, it's time to take your gains and move on. It can be helpful to use Gartner's "Hype Cycle" as a model for this strategy. 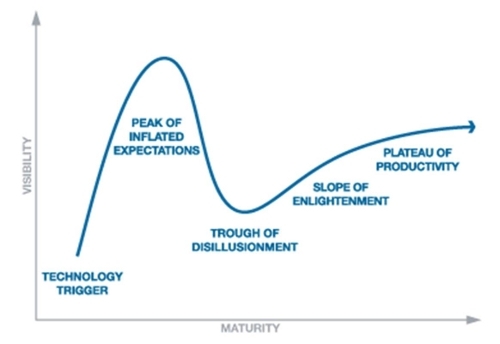 The Hype Cycle moves through five consecutive stages: a technology trigger, the peak of inflated expectations, disillusionment, enlightenment, and, finally, a plateau of productivity. There are two ways you can play this cycle. The first is to get in after the technology trigger (as soon as possible) and get out right before the peak of inflated expectations. The second strategy is to jump back in after disillusionment fades. The former will increase rewards; the latter will decrease your risk. Ideas don't materialize overnight, and neither do the fortunes of entire companies and their investors. With that in mind, it helps to have a disciplined trigger finger when both buying and selling. For instance, you might be bullish on the commercial space industry, bionics, and nanotechnology, but until those markets begin to mature, it's best to patiently watch from the sidelines. This way, when opportunities do arise, you'll be way ahead of those who are just getting into the market. On the selling end, you don't want to get shaken out after just one quarter of missed expectations. Set a stop-loss to protect your holdings, and remain optimistic about the future prospects of the company in question. A good strategy is to revisit the reasons you originally purchased shares — if your original justifications are still intact, hold on. Google is about to release a revolutionary product called Google Glass. Some techies get ahold of the device in a pilot program and decide to break it into pieces. They take a look inside and find components produced by a small, publicly traded company called Himax Technology (NASDAQ: HIMX). These techies post their findings online, but barely anyone notices. Several months later, Google announces it has purchased a 20% stake in Himax, and shares skyrocket. The scenario above is what we mean by digging deep. Now, you might be thinking it's unrealistic to start smashing open every new device you get your hands on — and you'd be absolutely right. Not only would this be incredibly expensive, but you probably wouldn't know what to look for in the first place. However, you don't need to be a tech expert to get information ahead of the market — you just need to know where to find it before the masses do. There are times when the loss of company talent can significantly impact shareholder sentiment and overall company performance. When you look at Microsoft (NASDAQ: MSFT) post-Bill Gates or Apple post-Steve Jobs, you begin to realize just how significant the loss of just one visionary mind can be. You might also imagine the negative effect on share price if Mark Zuckerberg or Elon Musk were to leave their darling companies. In many industries, talent is replaceable. But with technology, human resources can be hard to find. This premise extends beyond CEOs and touches equally crucial employees such as computer programmers, system analysts, and software developers. Yahoo (NASDAQ: YHOO) is one good example of the effects of brain drain. From 2009 to 2011, countless executives fled the company, and Yahoo's overall attrition rate hit record highs. Shares remained tepid during this three-year period. Yet when Marissa Mayer signed on as CEO in 2012, she managed to reduce attrition by 60%, and shares jumped 100%. High attrition is comparable to insider selling, while low attrition is a form of insider buying. No one knows where a company's technology is going more than the people that work there. If employees start to flee, so should you.